Anyway, I call this new painting my Flying Sea Turtle, for obvious reasons. It is amazing how these wonderful creatures swim and “fly” and drift in the sea. They are so beautiful to me. And yes, I plan to do more. By the way, I do not trace photos anymore unless one is just too difficult to do without tracing. I usually just eyeball things and draw. So I plan to be drawing some new creatures I haven’t drawn before which excites me. I recently went to our local book store and found some bargain books about various sea creatures including sea turtles, octopuses, hermit crabs, and other amazing ones such as beluga whales and whale sharks. I have been looking at them for about a week. Then yesterday I saw many of them in the movie Finding Dory. My daughter, a new friend of mine, and I went to see the movie yesterday. WOW! The animation Pixar people do is incredible! It just gets better and better all the time. Plus, it is an amazing and creative story. If you haven’t seen it yet, go! It is hilarious and sweet. We loved it. Getting back to the painting I am featuring today, however, I just wanted to share that another friend of mine recently told me what type of drawing ink pens she uses. I have been wanting to do more pen and ink combined with watercolor because I just love the crisp look the pen gives a painting! She told me she uses Micro-Line pens. So I purchased some online a few weeks ago, and I really love drawing with them! I am training myself to draw freely with them so I can do more spontaneous work instead of drawing something in pencil and going over it with pen. The “Flying Sea Turtle” was done freely! Very fun! 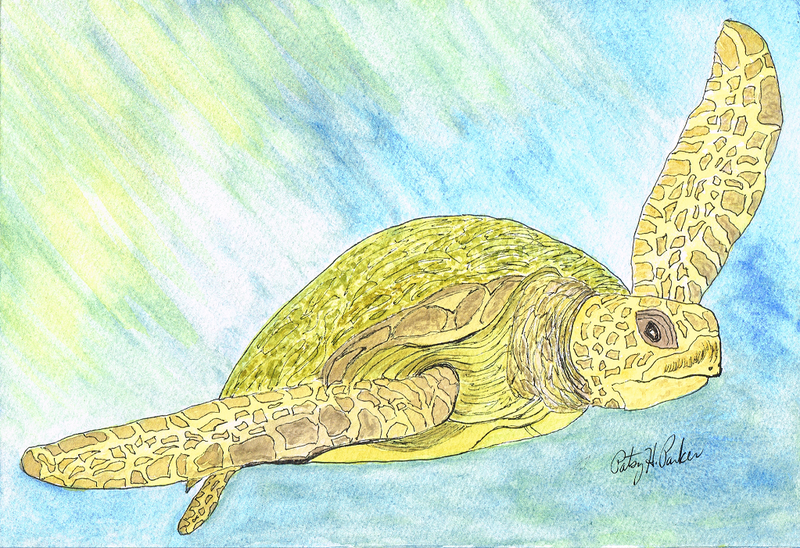 Posted on July 7, 2016, in Sea turtles, Watercolor Paintings and tagged Sea turtles. Bookmark the permalink. 3 Comments. Sweet picture. I LOVE that you are drawing with the new pens. So much more adventurous than using pencil first. Oh, I love this, Patsy! The colors are so beautiful. I’m happy to hear you’ve got Wi-Fi…yay!